We've made it to Friday, which means (hopefully) there will be some sort of kicking off your shoes in the very near future. I know we will be .. I also wish for all the moms out there the happiest of Mother's Days. Thank-you for who you are and all that you do ..
My local farmer just brought me extra spring greens, and the asparagus season is in full swing, so I’ll have plenty for making this beautiful looking pasta. Thanks so much for all of the yummy recipes! I just dug deep into your archives to find an apricot/ginger cookie recipe I recalled making. For some reason, our family cannot agree on cookies, but I remember that one made everyone happy. Sifting through several years of blog posts to find the recipe made me realize what an incredibly complex, rich, delicious, wondrous story you have already lived! This is pretty! I absolutely love asparagus! I did get a little obsessed at one stage and had it with every meal! haha This looks delicious. Wow! I must admit, this is new to me. I have never tried asparagus in pasta. I like asparagus so much specially grilled. I will definitely try this and my aunt will surely love this too. This pasta dish sounds fantastic. Maybe not as good as pizza and cookie dough but still, very very good. My family always laughs at me when I want my food to look pretty and taste delicious. Does make a difference. This look yummy. I admit that I have never had a huge thing for asparagus. I mean, it’s OK by me, but I’ve never included myself in the gotta-have-it club. This changed my mind! I’m amazed at how many different notes I pick up when it’s cut up this way and included so simply. Great dish! This reminds me of the pasta dish I make with a green vegetable but this one has cheese, cream and olive oil. It is a great spring meal and looks amazing. It’s my Mums’ birthday this weekend so hopefully I will get to spend some time with her. This pasta dish sounds absolutely delicious – I definitely need to try and make it myself. Asparagus is maybe one of the few veggies I can’t eat. My mom and sister devour it and my mom harvests them from the wild. I do love pasta though. And no, no rest this weekend I am afraid…still working! Pasta always makes me happy. This looks so amazing. I hope you have a fabulous weekend. Enjoy the Farmer’s Market. I always love going to those. Pea shoots are so trendy right now. In fact, I just did a spring pasta with an avocado cream sauce. You’d love it, Ali. Oh, and I sure wish that my neighbors had a prolific asparagus patch! This is a great recipe. I teach free community cooking classes at a non-profit food and nutrition agency that is similar to Project Open Hand in SF. 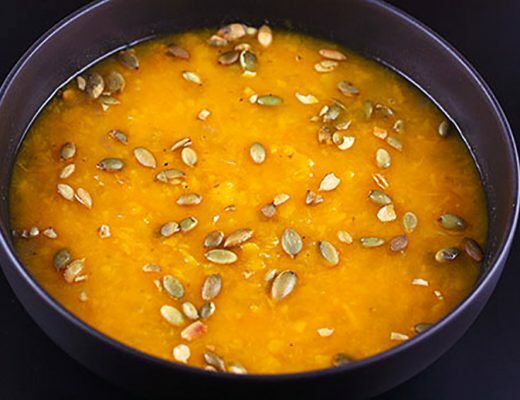 I am always looking for recipes that are quick, uncomplicated, and use basic ingredients. I will definitely be using this one now that our farmers market is open. Thanks! It almost looks too pretty to eat! This would be great for a lunch with a few girlfriends! Wishing you a lovely Mother’s Day! 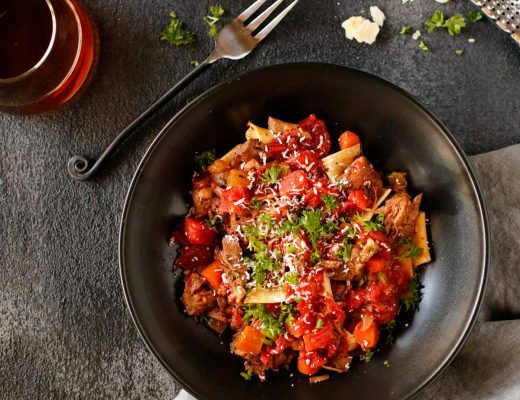 This pasta dish looks beautiful and delicious, and your weekend plans sound like perfection! Especially the part about lingering in pajamas haha. Hope you have a wonderful Mother’s Day! I often make stir-fried egg-noodles with sugar snap peas and baby corn cobs. 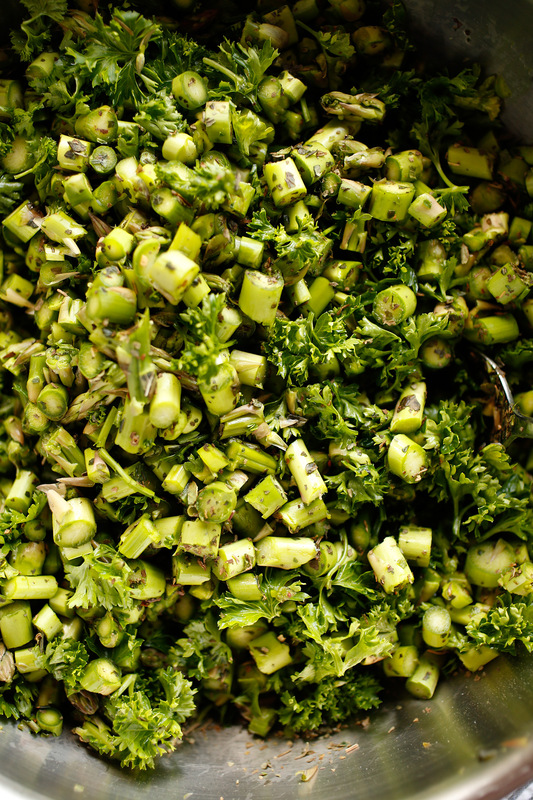 But with my favorite combination of spring vegetables unavailable here, I’ve been a little stuck for ideas. Any bunch of spring-time greens sounds perfect and a handful of herbs will brighten up the dish, too. Thanks for the inspiration! This email arrived at 4:30 pm and I was making it at 5 pm! It was fabulous, easy and best of all my children (7 and 9) were begging for more (a first). I made it with asparagus like you did and cut in small rounds and Cipriani pappardelle. I zested some lemon to add in the end, as well as a squeeze of lemon. Some freshly grated Parmesan before serving. Outstanding! That’s so cool about going to the best burger place. I wish I could say I kicked off my shoes but I had to go into work today and will be doing all the fun cleaning in the meantime. 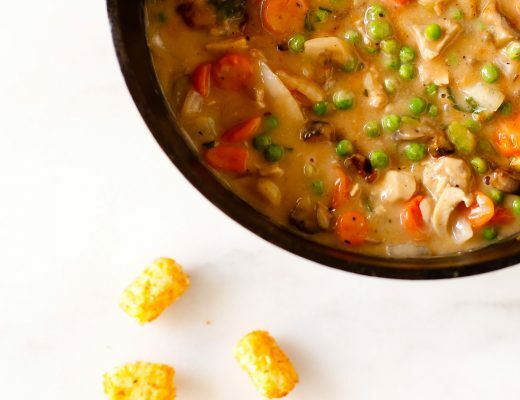 The recipe looks great and I am all about having easy recipes to make when I don’t feel like doing much. So often something you write strikes a chord, usually the twangy one I’ve been hitting over and over again and wondering what to do about. Thank you the beautiful inspiration to foster kindness in our lives! I love this! I have been working so hard to get more healthy recipes because our family enjoys eating a mostly whole foods diet! We eat lots of fruits, veggies and our favorite whole grain is Kamut Wheat. 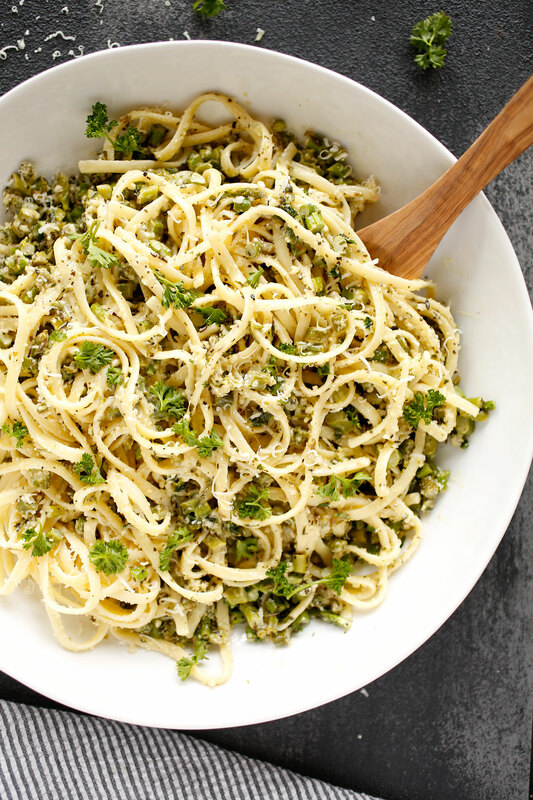 I would love to try this using Kamut pasta! Yummy! And perfect timing, I already have the asparagus, pasta, and parmesan, just itching to be turned into something delicious! This looks amazingly delicious! It has been awhile since I’ve made any pasta dish, but this shall change sometime soon. Always love reading a new post from you. Am in France for 3.5 more days. Being here makes me want to get back in the kitchen. Killing my waistline though. 😊 Looking forward to trying your pasta recipe when we return. The ability to whip up something fast from available resources at home is indeed an art. This is not something all can do. It is nothing short of magic. 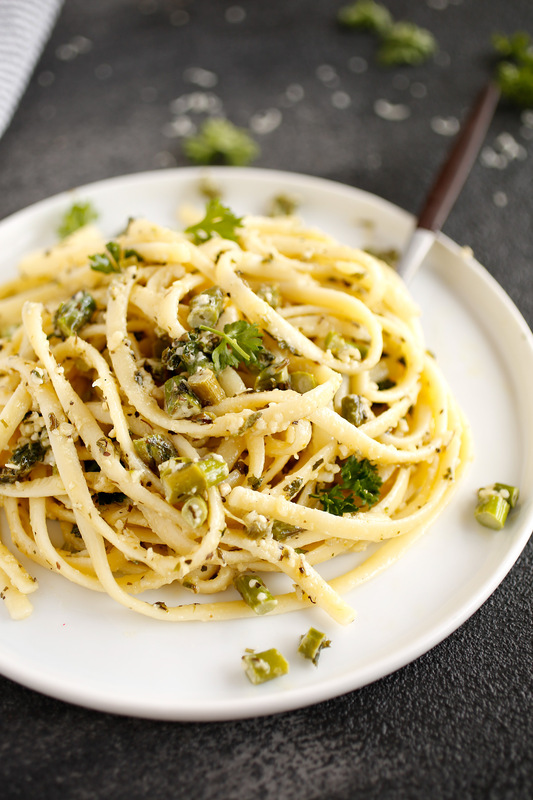 The spring pasta looks yummy and parsley and mint are sure to add a refreshing flavour. My plans this weekend have also been very relaxed and chilled. I’ve gotten work done and spent time with friends. You always have so many easy and healthy recipes. I loved this recipe because it has got so many greens and pasta is one of my favourites. Good and easy to make for a small get together. My Sicilian grandmother used to make a pasta and egg dish. She used Fideo, melted a little butter over the hot pasta, tossed in an egg and a little milk. I usually make this in the winter, it’s a good stick to the ribs kind of meal. Never thought to toss in some veggies though! Ahh yay for sunny weather! It’s gorgeous here too – finally! This looks lovely and it really is so pretty! I will have to make it this week! I have never envisioned asparagus and pasta together but this looks so good. I worked this weekend (and the majority of them) but I promised myself to attempt making some holiday balls as seen in your December post. Not bad. Oh such a delicious recip! 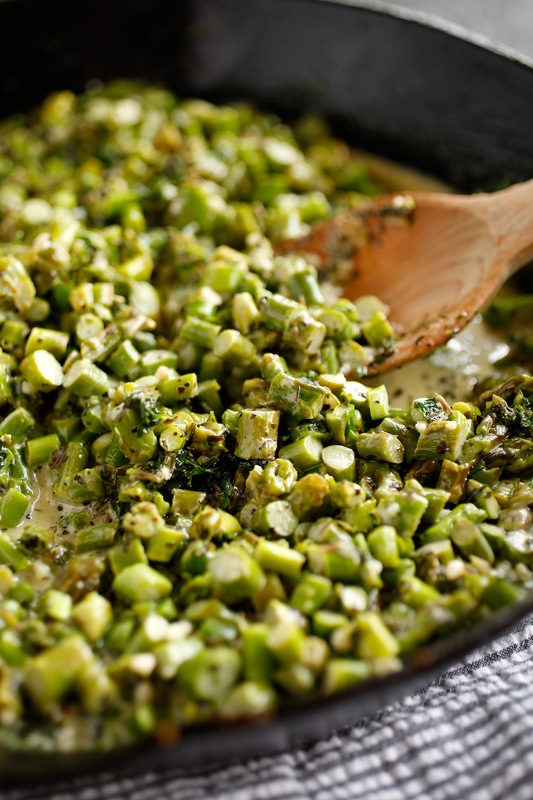 I have some asparagus sitting in the fridge, guess what I will be making for dinner tonight! I hope your weekend turned out just as well as it was planned to. We didn’t have Mother’s Day this weekend in the UK but I ended up spending it with my mother anyway and had a wonderful Sunday Roast. Funny how life turns out! Ali, I made this over the weekend and it was every bit as good as you said it was. Eating leftovers from the fridge the next day, it occurred to me that in cold form it was the best kind of pasta salad – the antithesis of the claggy mayonnaisey mess that haunts salad bars worldwide. Thanks so much for the recommendation! I have stumbled upon my local farmer’s market the other week and spotted some really nice veggies in there. I like it that here you can only buy a vegetable if it’s in season, and right now it’s the turn of the white asparagus. I have been buying green asparagus for quite a few weeks now, as it’s so cheap at the moment, and I’ve boiled it, baked it, grilled it, but didn’t think of adding it to pasta. Thank’s for the idea! How lucky that the winner was close to you. Hope you got to eat a burger!!! I’ve never seen asparagus that thin in my local supermarkets suppose I can try it with the normal chunky ones. I would love to make this with some fresh asparagus. And it sounds so easy to make – it would be a perfect weeknight dinner! I love a burger date!! And yes this is indeed the prettiest spring pasta I have seen in a long time, looks delicious too! This pasta looks perfect. I like green and spring food. It is full of vitamins and so fresh. Pasta is definitely one of our family favourites and your pasta and asparagus recipe look absolutely delicious. I hope you had a great weekend! This looks tasty and very light which is just what I like to eat on a nice spring evening. LOVED the spring pasta! I roasted the veggies first – asparagus and zucchini then tossed in some leftover peas. Split into 2 dishes – one with a gluten-free pasta for my GF hubby, the other with fresh fettucini for my son and I. YUM!! What an intriguing combination–-pasta, asparagus and other vegetables. A combination just right for spring meals. Lovely looking dish although I must confess I’d want to add some ham or chorizo. This is indeed the prettiest spring pasta ever! It looks very yummy too. Your recipe makes it sound so easy. Healthy, nutririous, good-looking! I would love some. Saving this recipe! The pasta is pretty… delicious, and filling.Another recipe to add to my collection of how to use asparagus. I can’t imagine how our grandmothers cooked without having all the ingredients in the pantry. By 6p.m. I would not even bother to open the fridge to check out ingredients that I may have…it would be take away or if not then my mental block will not allow me to think beyond eggs and bread. That pasta looks stunning and also sounds so healthy. I must try it out for dinner some time. I am kid free this weekend. I’ve loads to do around the house, Ikea first thing Saturday morning. Then meeting family and friends for a street party for the royal wedding tomorrow. Pasta is my favourite dish and I love asparagus but I’ve never thought to put them together! At the moment, I’m looking for healthier recipes as I’ve just had my gallbladder removed so will pop this on the list. The greens do look absolutely gorgeous in this dish! Perfect for a summer lunch in the sun! The pasta looks great, but your writing, as always, is the real reason I read your blog. Beautiful. Yup, it sure is the prettiest spring pasta. Better yet, it’s the prettiest pasta ever! I bet it tastes just as good as it looks. I am loving all the colors. I’ve always loved asparagus in my pasta but never thought to shred them. Gonna try it next time! Long time reader, first-time poster since I started a site of my own – but your writing and food have never failed to inspire. 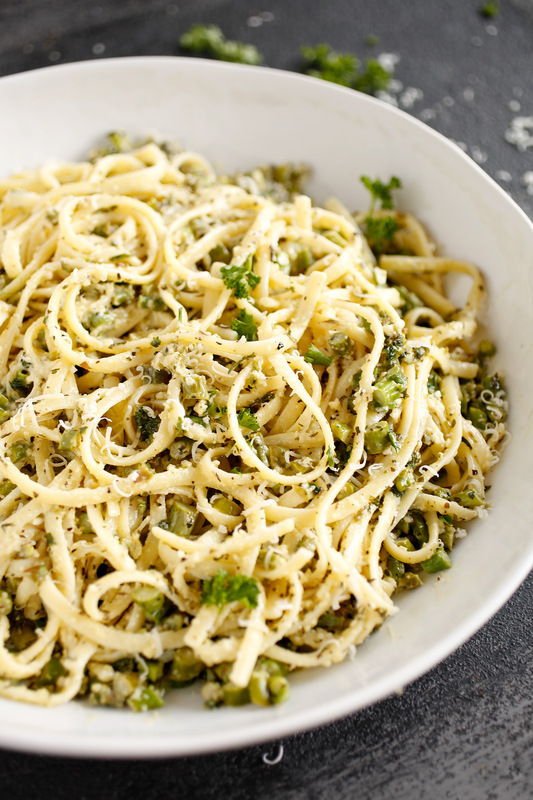 What a gorgeous looking pasta – the asparagus and parmesan seem like a great variation for spring! Some times dished is that are cooked from just a few simple ingredients taste the best. Great job with this dish it looks delicious. Pasta is my weakness and this looks amazing. I am saving this one for a future dinner. The photos look amazing.